Change … it’s something we’ve all learned to count on. Few others have been forced to deal with it as Canada’s First People have. The changes that came to European cultures over several centuries hit the Native people in just a few short years. 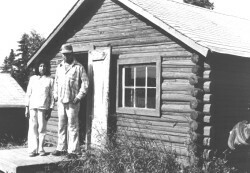 By 1946, when NCEM’s ministry officially began, life for most of Canada’s Native people had, in fact, already been affected dramatically. The changes have continued — and NCEM’s outreach efforts in bringing the Gospel of Jesus Christ to these people have also been affected by change. Travel in the Mission’s earliest years was slow and dangerous, mostly by boat or by dog-team … NCEM now operates several aircraft which transport personnel and supplies. Many more stations are now accessible by road. Literature was used in the Mission’s outreach right from the start. Though it once required the tedious task of setting metal type by hand … the Mission’s modern print shop now efficiently produces full-colour materials for ministry use. In the 1950’s NCEM began conveying the Gospel in Indian languages by radio to isolated communities and trap-lines. 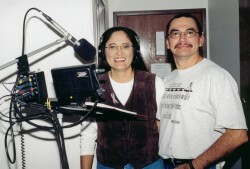 Though radio is still being used, NCEM now also produces the weekly television program “Tribal Trails,” broadcast coast-to-coast-to-coast by satellite. Training for Native Christians has always been a priority. From the first schools in Manitoba and Saskatchewan … until recently the Mission operated the Key-Way-Tin Bible Institute in Lac La Biche, Alberta. Hundreds of Native people have been prepared for Christian life and leadership. “Short-term” programs, once unheard of in Christian missions, have been used effectively on First Nations fields. In the early 1970’s the NCEM Missionary Training Course (NMTC) began and operated under that name for over 30 years. Our summer and short-term interns/apprentices continue to find cross-cultural ministry exposure. Numerous Native communities have been touched with the Gospel through them. Bible Camps have proven to be an effective outreach over the years. Hundreds of Native young people now attend Bible camp each summer in several locations across the country. Family camps are also held. NCEM also runs Wilderness Camps, taking First Nations teens backpacking or canoe tripping, and sharing the Gospel of Jesus Christ with them. By 1957 NCEM’s fields no longer included just “The North.” Ministry began that year among the Mi’kmaq and Malecite First Nations of Canada’s Maritime region. And by the end of the 1980’s, outreach had been established in several urban centres. Many changes have taken place in NCEM since its beginnings in the mid-1940’s. Yet the Mission’s goal remains the same. NCEM has seen God’s blessing, but has also often been reminded that the task is far too great to be accomplished apart from total dependence on God and through much prayer. Technology has changed the way the work is carried out. Yet there is one method that has not changed. It is a method that Jesus Himself used — He came physically to dwell among mankind. NCEM recognizes that nothing can equal the effectiveness of the physical presence of the missionary among the people. Literature, television and other media can have an important role, but cannot replace the listening ear and caring heart that is needed. NCEM’s resident church-planting missionary force remains its main thrust.